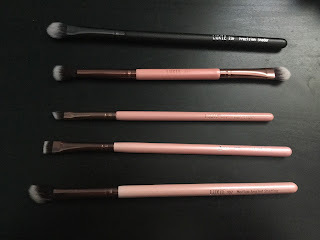 For this review, I am going to review Luxie brushes but instead of them being from one collection, they are from various Luxie brush collections and vary from face to eye brushes. 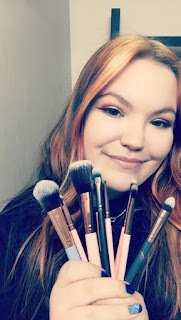 All the brushes were sent to me in Ipsy bags and seeing as how I've had a Ipsy subscription for a few years, I've gotten quite a bit of Luxie brushes. I'm just grouping all of them in one big review. For more on Ipsy, please feel free to visit their website right here. All of the Luxie brushes are handcrafted using hypoallergenic, high quality, vegan and cruelty-free materials. Please keep in mind the prices listed are in American dollars. I couldn't find this brush on their website but the brush on the left is used to blend colour into the crease and the brush on the right is used to apply colour on the eyelids. This brush is used to create the perfect cat eye or even filling in your brows using its firm and dense bristles. Priced $10. You can use this versatile eye brush to define and smudge out your lower lash line with your favourite eyeshadow. Priced $12. For the #1 foundation brush, I have noticed that it doesn't properly blend out full-coverage foundations. But using a light to medium coverage foundation this brush does work really well. The brush feels light and soft on my face. It doesn't feel harsh at all. You can tell that these brushes are made of good quality materials. I am going to give these Luxie Beauty makeup brushes 5 stars on 5! 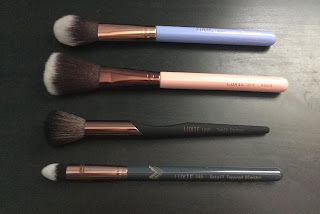 I love using these brushes and I know they won't fail me. Whether it be for face brushes or eye brushes I always get a great finished look with my makeup. I am so happy with these brushes and the fact that they are sent via Ipsy is awesome because they are not cheap brushes! I highly recommend you guys to try out their brushes.